The Department of Defense (DoD) Congressionally Directed Medical Research Programs (CDMRP) Gulf War Illness Research Program (GWIRP) announced that investigators at two institutions have been selected to create and manage two consortia investigating key aspects of Gulf War Illness. These two investigators, Dr. Kimberly Sullivan at the Boston University School of Public Health (BUSPH), and Dr. Mariana Morris at Nova Southeastern University, will each receive approximately $5 Million dollars to fund the two consortia. Gulf War Illness (GWI) is a syndrome characterized by multiple persistent symptoms such as chronic headache, widespread pain, cognitive difficulties, debilitating fatigue, gastrointestinal problems, respiratory symptoms, and other abnormalities that are not explained by traditional medical diagnoses or posttraumatic stress disorder. This complex set of chronic symptoms may affect as many as 200,000 to 250,000 veterans of the 1990-1991 Gulf War, out of the over 700,000 deployed to that region. The GWIRP focuses its funding on innovative projects that have the potential to make a significant impact on GWI, improving the health and lives of affected service members and their families. The two new consortia will conduct pre-clinical and clinical trials research at several leading universities, Department of Veterans Affairs (VA) treatment facilities and civilian hospitals. Because the two consortia share several key investigators, they will be able to build synergy between the investigators, capitalizing on expected as well as unanticipated results. Similar models and methods can also be expected to uncover complementary findings from the varied perspectives of the two consortia. "These consortia will greatly advance our understanding of the pathobiology of Gulf War Illness, discover biomarkers to more accurately diagnose it, and develop new treatments for this syndrome," said CDMRP Director COL Jeffrey Leggit, M.D. "Working collaboratively, the scientists, clinicians, and veterans at these premier organizations will be able to more effectively analyze the results of their research, the benefits of potential treatments, and bring these practices forward rapidly." COL Leggit added that the long-term goal of each consortium is to create a lasting infrastructure of relationships among the participating organizations. This will allow the consortia to continue to operate as independent entities for continuing research and future clinical trials focused on GWI. Kim Sullivan, PhD, Assistant Professor in BUSPH Department of Environmental Science will serve as PI and Director for one of the two new consortia. This consortium will explore a brain-immune hypothesis of Gulf War Illness, seeking to understand the pathobiological mechanisms responsible for the symptoms of Gulf War Illness in order to provide a scientific basis for identifying both diagnostic biomarkers and rational therapies. Dr. Sullivan expressed her vision and goals for the consortium: "Our consortium will study the brain-immune cross-talk pathways that we believe are related to the pathobiology of Gulf War Illness. We have assembled a team of experts from several disciplines including cell and animal researchers as well as clinical researchers that will allow us to further understand the brain-immune interactions and their chemical messengers that we believe are related to the pathobiology of Gulf War Illness. We believe that Gulf War Illness is not only a multi-symptom illness but also a multi-system illness requiring experts from multiple disciplines from leading academic and government agencies working together to solve. We believe that we can vastly increase our understanding of the pathobiology of Gulf War Illness and develop targeted treatments for its symptoms through this highly collaborative research consortium. " Marianna Morris, PhD, Professor and Director of Gulf War Illness Research in the Institute of Neuro-Immune Medicine at Nova Southeastern University, will serve as PI and Director for the second new consortium. This consortium will examine aberrant metabolic signaling affecting autonomic function, immune response, and endocrine function in Gulf War Illness, coordinate an understanding of abnormal signaling that can be used to drive translational models of Gulf War Illness to better facilitate effective treatments. Also participating in the BUSPH Consortium are scientists and clinicians from the Baylor University Institute of Biomedical Studies, at Boston University's Departments of Anatomy & Neurobiology, Biostatistics, and Psychology; the Center for Disease Control's Molecular Neurotoxicology Laboratory, Drexel University College of Medicine, Nova Southeastern University Department of Clinical Immunology, University of Adelaide, University of Colorado, and the Veteran's Administration Medical Centers in Boston and Miami. Participants in the Nova Southeastern University Consortium are scientists and clinicians from the Baylor University Institute of Biomedical Studies, the National Institute for Occupational Safety and Health (NIOSH) Molecular Neurotoxicology Laboratory, Nova Southeastern University Department of Clinical Immunology, Southwest Research Institute, University of Alberta Department of Medicine, Wright State University Department of Pharmacology and Toxicology, and the Department of Veterans Affairs (VA) Medical Center in Miami. The Congressionally Directed Medical Research Programs (CDMRP) funds innovative bio-medical competitive awards and manages research programs in cancer, military relevant injuries and conditions, and specific disease programs for the benefit of all Americans. Recognized for its unique collaborations among scientists, clinicians, consumers, and the military, the CDMRP is a subordinate command of the United States Army Medical Research and Materiel Command, Department of Defense (http://cdmrp.army.mil). When Edward Bryan, then a 35-year-old full-time firefighter, was called to serve in the Persian Gulf War in April 1991, he didn’t know he would come home to the US after 6 months with a slew of medical problems, including headaches, dizziness, gastro-intestinal problems, vision and memory loss, and hearing problems. Like many Gulf War veterans, Bryan was exposed to nerve gas, pesticides, and oil well fires. “It was a toxic dump,” said Bryan. Now 57 and living in Malden, Bryan is suffering from what is commonly known as Gulf War illness. He is among an estimated 175,000 to 210,000 veterans, out of about 700,000 troops who deployed, to return home with health problems. Many troops who served in the war were exposed to nerve gas, oil well fires and pesticides, and were given pyridostigmine bromide pills, an anti-nerve agent medication. Bryan, like other veterans, has been waiting for more than 20 years without clear answers or effective treatment for his symptoms. He has gotten used to hearing officials from the US Department of Veterans Affairs assert that the symptoms are tied to psychological stress. But in recent months, several breakthroughs have given veterans new hope. New research into the cause and treatment of Gulf War multi-symptom illness is underway in Boston, and recently, a VA whistleblower stepped forward to expose what he says was a cover-up of evidence that Gulf War illness is neurological in nature. The recent developments have Bryan and other veterans hopeful that “we may be getting neurological care instead of psychiatric care from the VA,” he said. Before he was sent to serve in the Gulf War, Bryan owned a house in Melrose, worked as a firefighter and was, in his words, “doing great.” After serving overseas, he lost his job and has been disabled by what he calls “white matter disease,” referring to deterioration in his brain. Bryan said it has been difficult to navigate the VA to get care. “There’s no guidance, there’s no direction,” he said. Despite his own illness, he tries to help other veterans deal with the VA, reaching out to them on Facebook and e-mail, or after meeting them at events such as hearings or parades. He said the lack of care has caused some veterans to self-medicate. “They’re taking more street drugs [or] they’re drinking in excess because of the lack of treatment and care,” he said. In recent months, there have been some signs that things could change. In March, Steven Coughlin, a whistleblower from the VA, testified to the House Committee on Veterans’ Affairs that the VA withheld information supporting Gulf War illness as neurological in nature. 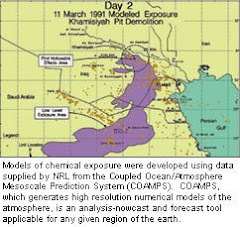 Coughlin participated in a VA study on Gulf War veterans and their exposure to pesticides, nerve gas, and oil well fires. The results have not been released, he said. The reason: “Anything that supports the position that Gulf War illness is a neurological condition is unlikely to ever be published,” Coughlin said in his committee testimony. A number of studies have provided evidence that Gulf War veterans are suffering from neurological problems. A consortium of researchers, led by Kimberly Sullivan, a research assistant professor of environmental health at Boston University, has launched a massive $5 million study to test the theory that a chronic inflammation in the brain is activating brain and immune pathways to cause ailments such as joint and muscle pain, memory problems, fatigue, headaches and gastrointestinal distress. Prior studies have found a deterioration of brain ‘white’ matter in ailing Gulf War veterans. Robert Haley, chief of epidemiology at the University of Texas Southwestern Medical Center in Dallas, also has led research linking chemical exposures to neurological changes. Haley found evidence that pesticides, nerve gas, and pyridostigmine bromide pills damage the receptors for an enzyme in the brain, which leaves them unable to respond normally to nerve stimulation. When Haley published a study about abnormal brain function, “the government sort of came after us and tried to discredit us,” he said. Coughlin believes that the VA is pushing psychological stress as the reason behind Gulf War illness because of a conflict of interest between VA’s research arm and the Veterans Benefits Administration, which must pay for treatment of any service-related health problems. VA officials have denied that they are thwarting Gulf War research, saying they are doing all they can to help veterans. Sullivan said Boston is “leading the way, in terms of treatment trials . . . to try and help these ailing veterans.” One trial at the Boston VA is testing a low-level laser therapy treatment, which may help with cognitive problems and fatigue. Another trial at the New England School of Acupuncture is using acupuncture to help with chronic pain. Sullivan is leading a treatment trial to test whether intranasal insulin helps with cognitive and other problems. “This is something that … is very dear to our heart because we’ve been working with these folks for a very long time to understand what’s really happening,” Sullivan said. As researchers work to figure out the puzzle, veterans like Bryan struggle to get by. Some days, it’s difficult for him to leave his house, he said. Sullivan is hopeful that a treatment can be found. This article was reported and written under the supervision of Northeastern University journalism instructor Lisa Chedekel, as part of a collaboration between The Boston Globe and Northeastern. (91outcomes.com) -- Gulf War veterans and their advocates are grateful that U.S. Senator Bernie Sanders (I-Vt.) has just launched this year's annual effort in the U.S. Senate to fund the treatment-focused Gulf War Illness (GWI) Congressionally Directed Medical Research Program (CDMRP). However, there is an extremely short deadline for other Senators to cosign. Cosigners are needed to help ensure this Gulf War Illness treatment development program is funded this year. The deadline for cosigning is the close of business this Thursday, April 25, 2013. Specifically, the push is to urge U.S. Senators to sign onto the "Sanders Dear Colleague Letter" for FY14 Gulf War Illness CDMRP funding. The text of the Sanders "Dear Colleague" letter is here. "This critically important treatment development program exists because countless Gulf War veterans and advocates contact their Members of Congress to ask that they sign on in support." Sen. Sanders is Chairman of the U.S. Senate Veterans Affairs' Committee (SVAC) and a longstanding champion on Gulf War and others veterans' post-deployment health issues, including leading Senate efforts on this program for the last several years. The Senate effort parallels one in the U.S. House of Representatives earlier this month, where Gulf War veterans saw a record level of bipartisan Congressional support. ACTION NEEDED: Ask both of your two U.S. Senators to sign onto the "Sanders Dear Colleague Letter" for FY14 Gulf War Illness CDMRP funding. Read this backgrounder, then Find your two Senators here. Check here to see if they signed onto last year's (FY13) request. Call the Washington, DC office [not an office in the home state] and ask for the legislative staff person who handles Defense Appropriations. If you get their voicemail, leave a detailed voicemail. Explain that you are a constituent, and very briefly (a couple sentences at most) state your connection to Gulf War Illness. [For example: "I'm one of the one in three Gulf War veterans suffering from Gulf War Illness". Or, "I'm one of many other veterans besides those who served in the Gulf War and I'm also suffering for chronic multisymptom illness, commonly known as Gulf War Illness." Explain that there is a "Dear Colleague" letter that you are specifically requesting the Senator sign onto. Provide the name of the "Dear Colleague" letter: the "Sanders Dear Colleague Letter" for FY14 Gulf War Illness CDMRP funding. State that there is a very short sign-on deadline: By close of business (COB) Thursday, April 25, 2013... and that you know the Senator will likely want to support the one-third of Gulf War veterans and others suffering from Gulf War Illness. Ask that the staff person follow-up with you to let you know the Senator's decision. Thank the staff person for their time. Follow-up to find out the status, if you haven't heard back. Be SPECIFIC with the REQUEST: Sign onto the Bipartisan "Sanders Dear Colleague Letter" for FY14 Gulf War Illness CDMRP funding. "Senator Sanders invites your boss to sign onto the below letter in support of continued CDMRP funding for the Gulf War Illness Research Program (GWIRP) in FY 2014. Deadline is close of business Thursday, April 25. To sign on or if you have any questions, please contact Steve Robertson at the Senate Veterans' Affairs Committee." Thank you for your continued support of the Gulf War Illness Research Program (GWIRP) within the Congressionally Directed Medical Research Programs (CDMRP), including the $20 million awarded to the program for FY2013. As the Subcommittee begins work on the FY 2014 Appropriations bill for the Department of Defense, we are pleased to point out the dramatic progress made by the program during the past three years. In 2010, the Institute of Medicine (IOM) officially recognized that the chronic multi-symptom illness affecting 250,000 Gulf War veterans is a serious disease not caused by psychiatric illness that also affects other U.S. military forces. The IOM report called for a major national research effort to identify treatments. In January 2013 a new report, also from IOM, confirmed that, “preliminary data suggest that [the illness] is occurring in veterans of the Iraq and Afghanistan wars as well." In March 2013, Georgetown University published a groundbreaking study that found that veterans who suffer from Gulf War Illness have physical changes in their brains that may account for pain while performing normal daily tasks. The scientific community has responded with a dramatic increase in the quality and quantity of proposals submitted to CDMRP. Most encouraging, CDMRP-funded researchers have completed the first successful pilot study of a medication to treat one of the major symptoms of Gulf War Illness. In recognition of this progress, a bipartisan amendment to the Defense Appropriations Act of 2012 provided $10 million for the program, and a bipartisan amendment to the 2013 Act provided $20 million for the program. The $10 million increase in FY13 offset a corresponding $10 million reduction in Gulf War illness research at the Department of Veterans Affairs (VA). We appreciate the support you have given to make this progress possible and respectfully seek your support in FY 2014 for adequate funding to continue the progress that has been made. Funding will be used for pilot studies of promising treatments, for clinical trials of treatments shown effective in earlier pilot studies, and for the execution of collaborative treatment research plans developed by consortiums of scientists funded by CDMRP in FY 2010. This small yet effective program warrants support, even in a time of fiscal austerity. The GWIRP is the only national program addressing this issue. It is a competitive, peer-reviewed program open to any doctor or scientist on a competitive basis. By contrast, VA’s research programs are open only to VA doctors, few of whom have expertise in chronic multi-symptom illness. Unfortunately, VA decided to cut its Gulf War research budget from $15 to $5 million in FY 2013. Furthermore, the CDMRP is providing significant outcomes. CDMRP-funded researchers at the University of California, San Diego, reported in June 2011 on the first successful medication treatment study in the history of Gulf War illness research. The study showed that the supplement CoQ10 produced significant improvement in one of the most serious symptoms of Gulf War illness, fatigue with exertion. This discovery is not a cure, and more work needs to be done to address this illness that affects 250,000 Gulf War veterans. We respectfully request that you continue to provide the necessary resources to accomplish this vital program. 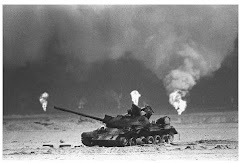 Twenty-two years ago this month, the 1991 Gulf War came to an end. Of the approximately 700,000 American troops sent to the region to lead a multi-national effort to oust Iraqi dictator Saddam Hussein from Kuwait, about a third have since been affected by an illness known as Gulf War Syndrome. The chronic multi-symptom disorder has proved difficult to diagnose and treat. But last month, scientists at Georgetown University announced what could be a major breakthrough. For some veterans in Maine, it's been a long and frustrating wait. 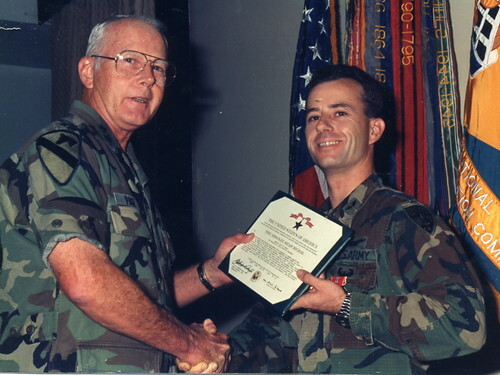 Eric Spear, right, receiving an award for his military service. For the first time, researchers have found evidence that veterans with Gulf War Syndrome undergo physical changes in their brains. It's believed that those changes make people susceptible to pain and fatique. And for 53-year-old Eric Spear of Oakland, Maine this is welcome news. "The thing that really bothers me though is that it's taken them so many years to finally come up and say, 'Yeah, we think this happened over there,' - that by the time they finally figure the whole thing out, a lot of us are going to be dead and gone," Spear says. 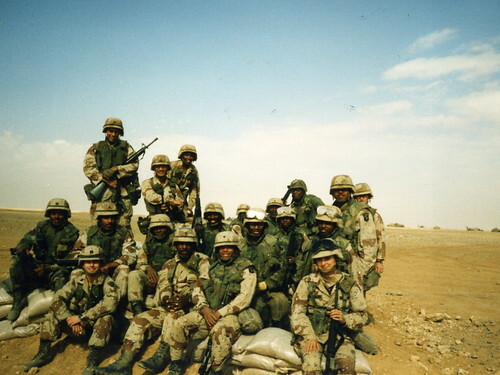 Eric Spear (front row, far left) during his deployment overseas in the Gulf War. 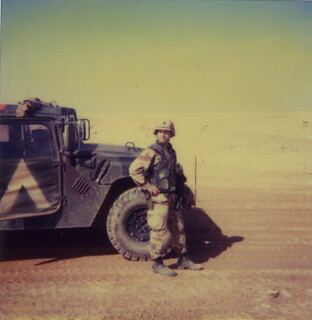 Now a state employee, Spear was deployed to the desert in January '91, as a captain attached to the 101st Airborne Division, where he was in charge of refueling operations for the push into Iraq. He returned to the U.S. three months later, in seemingly good health - at least for a while. "For me it was about three or four months after I got back to Fort Hood," Spear says. "It started hitting me when we were out doing PT in the mornings - you know, we'd go out at 6.30, we'd do our push-ups and sit-ups and 3-mile runs, and after a while I got to where I couldn't finish the 3-mile run without getting dry heaves, throwing up, and getting really tired." Before long he couldn't run at all. After an exhaustive series of tests, he was eventually given a diagnosis. "They didn't call it Gulf War Syndrome at that point, they called it chronic fatigue syndrome." In 1992, after 12 years active duty, Spear (in photo, left) took early retirement from the Army, which has rated him 30 percent disabled. Over the years, Spear says he has also been plagued with low-grade fevers, headaches, stomach problems and short-term memory loss. But the Texas native says it's the fatigue that's affected him the most. "I changed my whole life around to deal with the fatigue. One of the things I did was move up here in Maine where it had a cooler climate, and get a job with the state so I could work inside at a desk job." Even with the help of antibiotics, Spear still finds life difficult. He limits food intake to one evening meal a day. Anything more and he becomes too exhausted to function normally and has to sleep. The story of Eric Spear and others like him is a familiar one to Alison Johnson, of Topsham, Maine. She's written a book about Gulf War Syndrome. During her research, Johnson interviewed dozens of veterans, and found that their symptoms varied widely. "Medical people like to have diseases or conditions fit into a neat little category where you list off four or five symptoms, and this constitutes that condition or disease. But with Gulf War Syndrome different people have different reactions," she says. Some might have asthma, she says, while others experience memory loss, joint pain, migraines, or - as Eric Spear knows only too well - fatigue. Just as there's no one symprom for Gulf War Syndrome, neither is there one clear cause. Some theories include exposure to toxic chemicals on the battlefield: burning oil wells, pesticide and nerve agent antidotes that were administered to the troops. The recent Pentagon-funded study at Georgetown scanned the brains of 31 veterans with GWS, and 20 control subjects. In the veterans' brains, it found abnormalities in the bundles of nerve fibers that connect the areas of the brain involved in processing pain and fatigue. Some veterans feel pain doing something as simple as putting on a shirt. Alison Johnson says the study's implications are enormous, and go beyond the military world. "So many people with chronic illness conditions have been looking for a biomarker, and this does seem to indicate a test that could show why they're so sick," Johnson says. "So this has great implications for chronic fatigue syndome, multiple chemical sensitivity, fibromyalgia and irritable bowel syndrome." "I'm just looking forward to working with my colleagues to provide some additional resources to do more research in this area," says Democratic Maine Congressman Mike Michaud. Michaud is ranking member of the House Veterans Affairs Committee. In 2011 he helped secure $10 million in funding for the Georgetown study. "'Cause I was hearing a lot from soldiers that served in the Gulf War, and the fact that no one was really paying any attention to them, as far as their problems." Michaud is helping lead a congressional effort to keep the funding level at $20 million for the coming fiscal year. Maine veteran Eric Spear says this is all positive news - especially for those veterans who have not had their illnesses formally recognized. For him, it's unikely to change anything: His illness is already recognized as being service-related. Also, he's not sure he wants a brain scan, "because I know there's something there," he says. "I don't know if I'd want to actually verify that I had something damaged in there." As for the years he spent in uniform serving his country, he says he has no regrets. "When I think back, I don't know - just the way I was raised, or I'm a patriot or whatever, I don't know - but if I knew that I was going to have what I have now and they asked me to go back, if I had to do it all over again, I'd still do it again." View the Georgetown University Medical Center study on Gulf War Syndrome. Photos courtesy of Eric Spear.